The Oasis makes reading a pleasure, but its free 3G only works inside the United States. A typical iPhone or iPad is capable of doing damn near anything you need it to—so long as you don’t need to do it in direct sunlight. And while those devices certainly become more energy efficient over the years, heavy users like me still find it difficult to get through a full day without having to top of their tablet or smartphone battery at least once. That’s why I usually travel with an e-reader. Their matte e-ink displays are easy to read in direct sunlight, making them a great choice for the beach or to pass the time waiting for a train. Better still, they absolutely sip power. I’ve gone weeks between recharging a Kindle or Kobo e-ink slab, despite using them for hours at a time. Try that with an iPhone. So, when I was extended the invitation to take Amazon’s latest Kindle, the Oasis, for a spin, I jumped at the opportunity. Let’s get this out of the way: The Oasis ain’t cheap. It starts at $290. 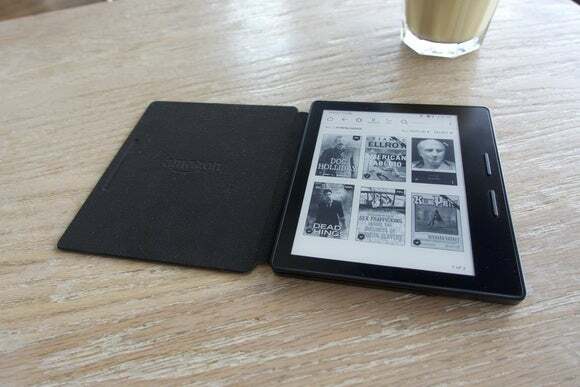 The version I tested, which comes with a built-in 3G connection for downloading books on the go and without any irritating Amazon advertising, sells for $380. (You can grab it for $20 less “with special offers,” i.e. ads.) In a world where it’s possible to pick up a great little multi-function tablet like a 16GB iPad Mini 2 with Wi-Fi and cellular for just $19 more, convincing anyone that a one-trick pony like the Oasis is a smart buy is a tough sell. While Both the Oasis and the Paperwhite have identical display sizes, their overall footprints and weight are significantly different. The first thing that long-time Kindle users will notice about the Oasis is its size. 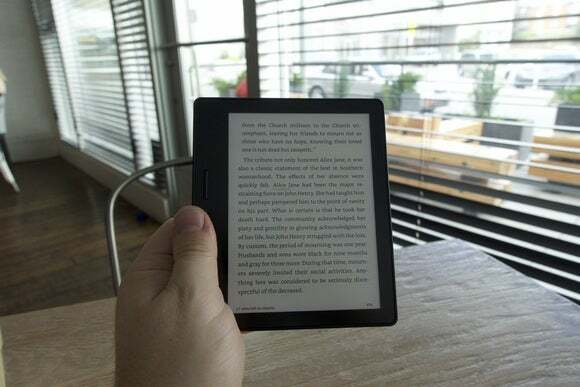 Measuring 5.6x4.8x0.3 inches and weighing a mere 4.7 ounces, the Oasis is, as Amazon is quick to proclaim, the thinnest, lightest Kindle that they’ve ever made—close to two ounces lighter than a 3G equipped Kindle Voyage and almost three ounces less than a current generation Kindle Paperwhite. Like these chunkier cousins, the Oasis comes equipped with a 6-inch antiglare 300 ppi display. With the backlight turned off, I didn’t notice a difference between reading on my 2014 Paperwhite and the Oasis. But with the backlights turned up, it’s a very different story. The Oasis employs 10 LEDs to ensure even backlighting across its display, beating out the patchier light the Paperwhite’s four LEDs produce. This isn’t to say that the Paperwhite is a horror to read on—I’ve been satisfied with mine for years. The Oasis’s display backlighting is simply better. Its light weight and superior backlighting come at a cost, however: The Oasis has a significantly shorter battery life than its recent predecessors. Where a Kindle Paperwhite could potentially go for months between charges, the Oasis’s internal battery can only manage about two weeks of use, depending on your reading habits. The more abuse the Oasis’ leather battery cover takes, the better it looks. To boost the Oasis’s run time, Amazon baked a battery into the its cover. 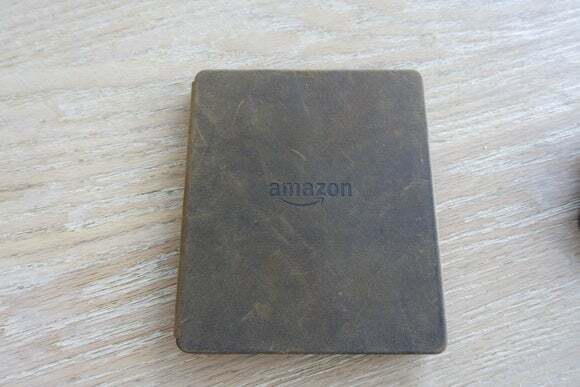 The battery cover, available in chestnut brown, black or red leather, will begin to charge the internal battery as soon as it’s magnetically mated to the e-reader’s asymmetrical chassis, significantly boosting your reading time. 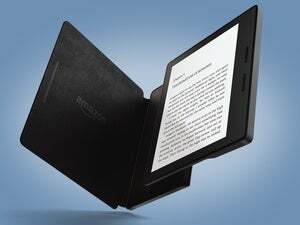 Amazon claims that between the Oasis’s two batteries, it’s possible to wring eight weeks of use out of the device, provided you keep your reading to 30 minutes per day and keep the screen lighting turned down to a reasonable level. On average, I read a few hours per day. As such, a month into my using the Oasis, I’ve already had to charge it once. The Oasis’s battery cover mates to it magnetically. The edge of the Oasis that the battery cover connects to is wider and deeper than the rest of the device and contains the e-reader’s battery. Why jam the battery into one end of the thing instead of spreading it out flat like you see with other Kindles or tablets? Because doing so allows for a couple of awesome features. 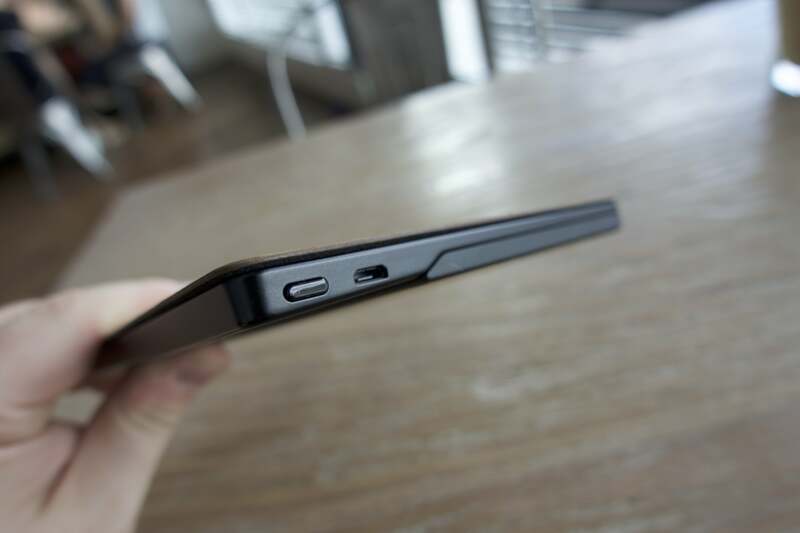 First, when the Oasis is not in its cover, its battery bump makes a great handle for one-handed reading. Buttons for turning the pages can be found in the bezel. The shape and width of the bump is such that when you hold it, your thumb naturally rests on the wide bezel just to the side of the display. It’s a ideal location to place a pair of page-turn buttons—so that’s exactly what Amazon did. An accelerometer makes sure that the text on your Oasis will always be right-side up. Lump all of this in together and you get a lightweight e-reader that you can comfortably hold with one hand, while still turning pages. And thanks to a built-in accelerometer, the Oasis can be used by left or right handed individuals without compromise. Simply flip the Oasis over and the text on its display and page-turn buttons will adjust to the device’s new orientation. Hate buttons? No problem: You can also control the Oasis via its touchscreen. So, that’s the fancy. Let’s talk about the plain. 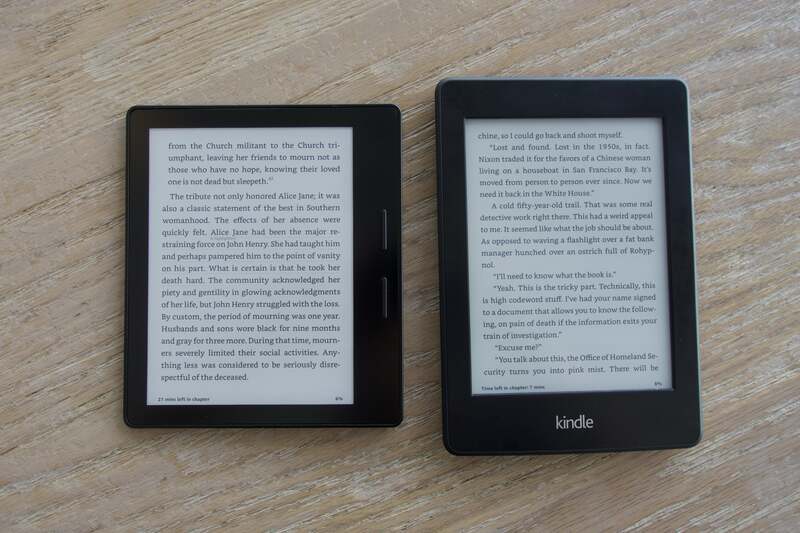 The Oasis uses the same operating system as Amazon’s other Kindle e-readers; if you have used a Kindle in the past, you’ll find no surprises here. It has the same amount of internal storage as the Paperwhite and Voyage. And, despite having 1GB of RAM—twice that of a current generation Paperwhite—I didn’t notice a huge improvement in performance. None of these things are terrible, but you’d like to think that with it’s costing $190 more than the latest iteration of the 3G-equipped Paperwhite, there’d be a significant boost in performance. And while we’re on the subject of 3G, don’t expect to download any books via cellular while you’re outside of the United States: The Oasis’s free cellular activity only extends as far as America’s borders. Given the number of places I roam where Wi-Fi is scarce but cellular connectivity abounds, I found this deeply disappointing. So, should you buy one? I’ve got a few answers to this question. If you demand the very best out of every piece of hardware you own, cost be damned, then yes, you’ll be happy with the Kindle Oasis. Despite the shortcomings of its cellular connectivity, It’s a great piece of gear and, last I checked, Amazon still had the largest selection of book and periodical titles to choose from, anywhere. That said, if cost is a factor, go with a Kindle Paperwhite. 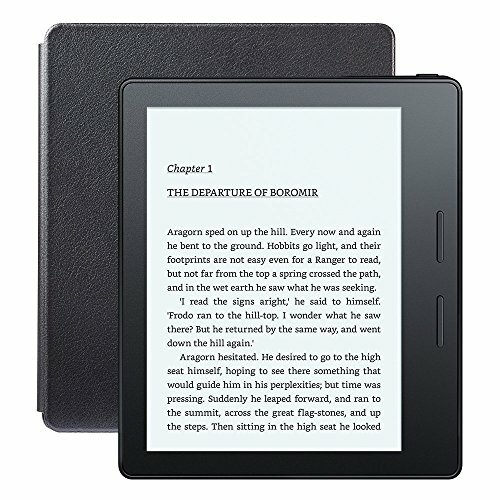 It’s a perfectly capable e-reader similar in capability to the Oasis, but at a fraction of the price. It's better than the Paperwhite, unless you need 3G overseas. Comfortable design is easy to use one-handed. Battery life not as great as other Kindles. 3G connectivity unavailable outside the United States.